Makeup and Beauty - Hershesons. 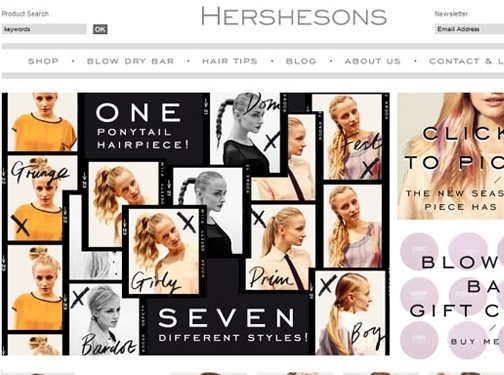 Opened back in the earlynineties, it was only a matter of time until Hershesons established themselvesas one of the leading companies when it came to hair extensions and hairaccessories. With three of their own 'blow dry bars' open in London, one ofwhich is in the Harvey Nichols store the brand soon became a hot favourite withmodels, celebs and the press! UK (London) based company offering hair extensions and accessories for sale, as well as hairdressing services. Website features e-commerce facilities, delivery information (under "shipping policy"), returns policy (under "terms and conditions"), photo gallery of hairstyles, blog, hair tips, full company contact details.